There are 49 Assisted Living Facilities in the Palm Desert area, with 16 in Palm Desert and 33 nearby. The average cost of assisted living in Palm Desert is $3,632 per month. This is higher than the national median of $3,346. Cheaper nearby regions include Rancho Mirage with an average starting cost of $3,048. To help you with your search, browse the 129 reviews below for assisted living facilities in Palm Desert. On average, consumers rate assisted living in Palm Desert 4.5 out of 5 stars. Better rated regions include Cathedral City with an average rating of 5.0 out of 5 stars. Caring.com has helped thousands of families find high-quality senior care. To speak with one of our Family Advisors about assisted living options and costs in Palm Desert, call (855) 863-8283. Palm Desert, a community in Riverside County, is a popular spot for retirees and "snowbirds," who descend on the city in the tens of thousands each year. Seniors, who make up over 32 percent of the population here, may want to check out The Living Desert Zoo and Gardens, a popular attraction, as well as the city's serene natural pools and parks. There are 15 local assisted living facilities in Palm Desert and 44 nearby. Each facility is governed by the California Department of Social Services, Community Care Licensing Division, which refers to assisted living facilities as Residential Care Facilities for the Elderly. The city of Palm Desert has some of the worse air quality in the nation. Seniors who suffer from respiratory illnesses should consider this before moving to the city. Elevating property crimes in Palm Desert are now 65 percent higher than the national average. These crimes are higher than 90 percent of all other communities of comparable size in the state safer than this city. Low violence drops violence crime rates 272 percent below the national median. The cost of living in Palm Desert is only 10 percent higher than the national average. Other cities in California have a higher median and are usually 52 percent higher, making it an affordable option for low or fixed income seniors. The Palm Desert area is home to world-class medical facilities, including Eisenhower Primary Care - Palm Desert, Kaiser Permanente Palm Desert Medical Offices and Optimal Health Center, in the event of medical emergencies or illness. California is known for not being tax-friendly and does not provide seniors with a tax-exemption on retirement income other than SSI. Palm Desert residents have a combined 7.75 percent sales tax compared to the 6 percent national average and 8.54 percent state average. Palm Desert has an array of community resources for seniors, including Cover Communities Senior Association - The Joslyn Center, an organization that provides social and health services, wellness center and programs, information and group activities and own one senior center. Assisted Living costs in Palm Desert start around $3,632 per month on average, while the nationwide average cost of assisted living is $4,000 per month, according to the latest figures from Genworth’s Cost of Care Survey. It’s important to note that assisted living rates in Palm Desert and the surrounding suburbs can vary widely based on factors such as location, the level of care needed, apartment size and the types of amenities offered at each community. Eligible seniors in the Palm Desert area have one available Medicare option and two state options for financial assistance. 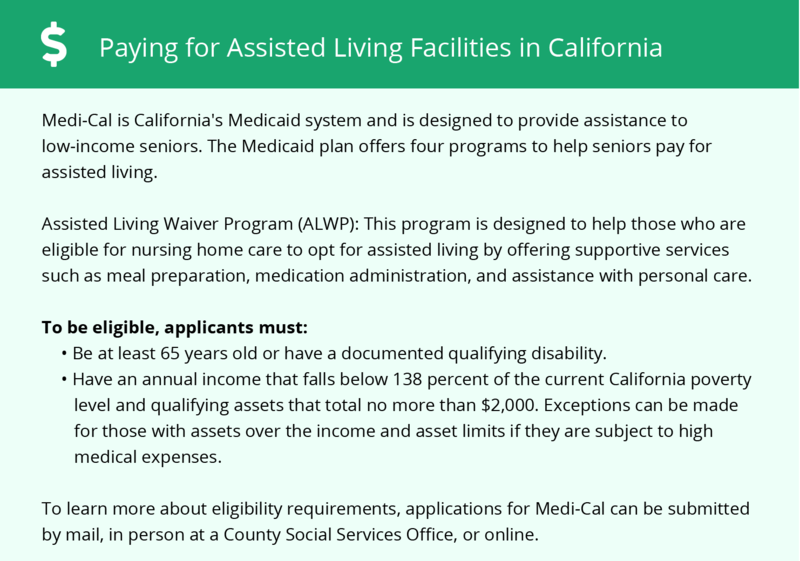 These include the Med-Cali Home and Community-Based Services (HCBS) Assisted Living Waiver (ALW), Supplemental Security Income (SSI) and the optional state supplement (OSS). Palm Desert and the surrounding area are home to numerous government agencies and non-profit organizations offering help for seniors searching for or currently residing in an assisted living community. These organizations can also provide assistance in a number of other eldercare services such as geriatric care management, elder law advice, estate planning, finding home care and health and wellness programs. To see a list of free assisted living resources in Palm Desert, please visit our Assisted Living in California page. Palm Desert-area assisted living communities must adhere to the comprehensive set of state laws and regulations that all assisted living communities in California are required to follow. 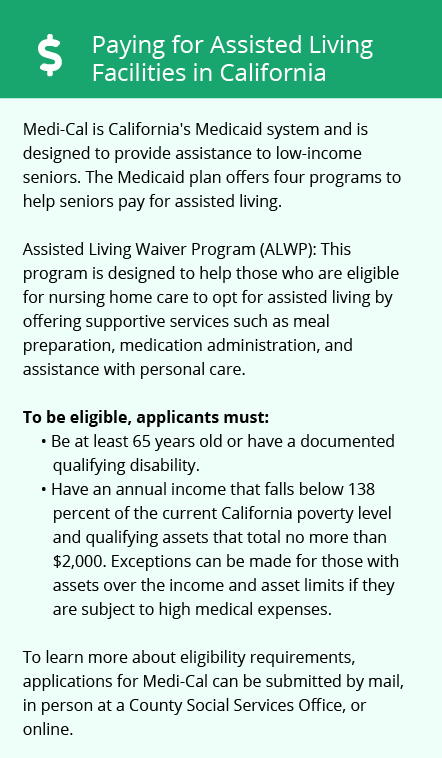 Visit our Assisted Living in California page for more information about these laws.